The Pali words for tree are rukkha, duma, jagataruha 'earth grown', padapa, 'foot drinker' and vitapin (A.III,43; II,43; Bv.9,28; Ja.I,216; VI,178). The Jataka says: 'It is called a tree because it has branches. Without branches it's just a stump' (Ja.IV,483). The Tipitaka mentions many types of trees, a good number of which can be identified. Trees in general are also frequently mentioned. 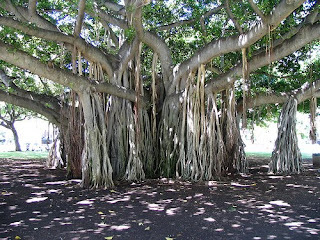 Some of the structural components and other parts of trees referred to include the roots (mula), the trunk (danda or khandha), the periderm or outer bark (papatika), the phloem or inner bark (taca), the sapwood (pheggu), the heartwood (sara), branches (sakha), twigs (pasakha), leaves (panna or patta) and crown (agga, M.I,193-6). There were still large forested tracts in northern India during the Buddha's time. The Mahavana or Great Forest, extended almost unbroken from the outskirts of Vesali to the foothills of the Himalayas. Once, the Buddha stayed in a forest near the village of Parileyya where an elephant looked after him (Ud.42). Other forests visited by the Buddha were the Dark Wood near Savatthi (S.I,130), the Forest of Offering at Kusinara (A.V,78), the Gosinga Forest at Vesali where many sal trees grew (A.V,134) and the Cool Wood to the west of Rajagaha near the city's charnel ground (A.III,373). Very large and majestic trees were sometimes called vanaspati, `forest lords' (S.IV,302; Vin.III,47). The Buddha encouraged monks and nuns to seek solitary lodgings in the forest (A.II,250), 'at the roots of trees, mountain slopes, a glen, a hill cave, a cemetery or a woodland grove' (M.III,3). He said: `The one who wears rag-robes, who is lean, with protruding veins and who meditates alone in the forest - him I call a true Brahmin.' (Dhp.395). Some monks tried living in hollow trees and in the fork of trees (Vin.I,152). A forest-dwelling monk was advised not to settle down at the foot of a tree on a border, one used as a shrine, one from which resin or fruit was collected, one in which flying foxes roost, a hollow tree and one growing in a monastery (Vis.74). However, forests could also be frightening places; they were the abode of dangerous animals and bandits and travelers could get lost in them (A.I,153; Ja.I,320; S.I,181; III,108). The Buddha commented that when he lived in the forest before his enlightenment sometimes at night `an animal would prowl around, a peacock would snap a twig or the wind would rustle the leaves' and he would be filled with terror (M.I,210). Villagers living near forests sometimes acted as guides for those wanting to travel through them. (Ja.II,335). Those entering the forest had to be careful of what fruit they ate as some were poisonous (Ja.III,200). Some forested areas were thorny, unpleasant and difficult to walk through without getting cut or scratched (S.IV,189).